Tubing on the crystal clear Ichetucknee River is a unique experience in North Central Florida. Where else can you leisurely float down a cool (73 degrees), clear river and enjoy pristine forests and wildlife with no development in sight? The Ichetucknee (pronounced “Itch-tuck-nee”) Springs State Park was created in 1970 to preserve the natural beauty of the spring fed river. Ichetucknee Springs State Park is located about 45 minutes northwest of Gainesville. Worried about being watched by snakes, or alligators? Fear not, the noise of tubers on the river drives away most animals, and the park removes alligators. 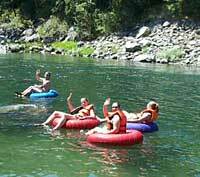 Tubing on the river is very safe and tubers come in all ages since the river never gets rough and has a gentle current. There are two entrances, a south and north entrance to this Florida State Park. The south entrance has two shorter parts of the river, and the north entrance has the longer portion. The park’s brochure recommends use of the south entrance for tubing to lessen the impact on the narrow, shallow reaches of the river’s north end. In keeping the river and the area pristine, only up to 750 tubers a day are permitted between the north end and midpoint. More tubers are allowed along the two south parts, the midpoint launch and Dampier’s Landing, but early arrival is still recommended on weekends and holidays. Conveniently, the park provides free tram service from the take out points and the midpoint and north end launches. What does one use to float? Just about anything found in one of the many roadside stands that rent inner tubes, rafts, double connected or “sweetheart” tubes, and other floating devices. Almost all the roadside vendors rent the basic inner tube for $2, and the more sophisticated floating devices such as rafts and the “sweetheart” tubes rent from $5-$8. The vendors will tie down the floating devices on your vehicles’ roof or in your trunk, but you do not have to return the floats. The floats are numbered with the roadside vendors’ number and there are designated areas in the park for drop off. The float vendors are difficult to miss and will be found near either of the parks’ entrances. Renting outside the park is recommended since the park charges almost double for the same floats with the only difference of not having to carry the floats in your car.